Sustainability is often about making the invisible visible. 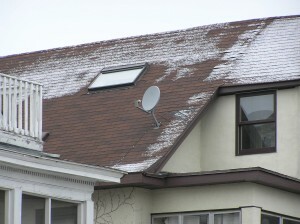 It’s impossible to see which house is leaking energy in the winter. Or where a watershed starts and ends. I love when the invisible becomes visible. Third-party certification for coffee or buildings or cleaning products was created so customers can SEE that one choice is intentionally going above and beyond the bare minimum. I love the window seats on planes, because suddenly, topography becomes obvious. Out west, you can see rainfall patterns, and erosion. The abstract concept of a watershed becomes something you can see. I also love those winter days when the roofs are covered in frost or a dusting of snow. Suddenly, you can see heat escape. There is attic insulation, probably above the ceiling of the attic apartment, but the melted strip just left of the very white front room is either missing insulation or has air leaks in it. 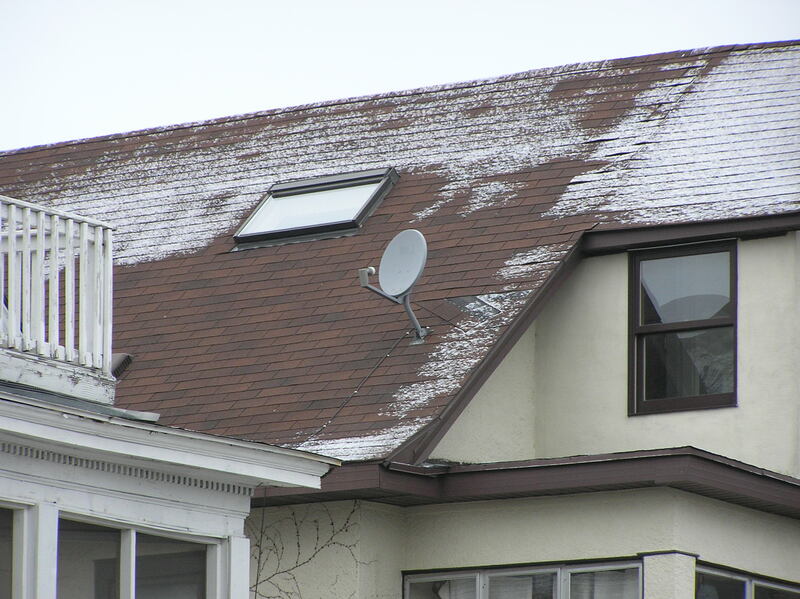 There appears to be no insulation below the peak of the attic. If there are narrow strips of frost between wide bands of melting, there’s probably no insulation — the wood in the rafters “insulate” better than the air, like at the very tip top of the roof in the picture above. 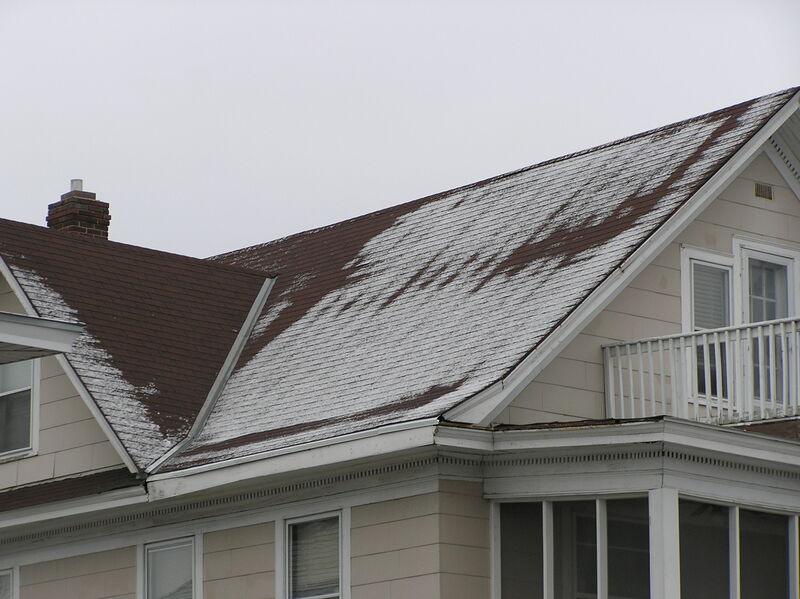 If there are narrow strips of melting between wide bands of frost, it signals that there is insulation — the rafters transfer heat better than the insulation. I’m constantly looking for tools to make energy, water, toxin, health or other more sustainable choices accessible to customers. Without that knowledge, customers can’t necessarily make the choices they want to make. How do we build energy or sustainability scores into apartment advertising or MLS forms for people looking for housing? How can we add durability and repair-ability information to retail options? This is cross-posted on Christine Capra’s blog. I’m nerd enough to love data, and I understand how much information isn’t available to me when I look around a room. I WANT TO KNOW! Knowing is magic. In my first practicum about network weaving, coordinated by June Holley and Kristin Johnstad, I learned about network mapping from Ken Vance Borland. I was sold on their value. Maps help people to visualize this abstract concept which is the network. If you do regular updates, people can see how they strengthen over time — turning that squishy relationship-building from time that might feel wasted to a visible, valuable outcome. Maps make invisible information visible. You can see people’s interests. You can see whether people with shared interests know one another. You can uncover expertise. I often talk & write about building trust within the networks. Today, I want to take a few minutes to tell you one Thanksgiving-themed thing I’m doing to increase the level of trust in my corner of the world, and I invite you to take five minutes to do it, too. As I’m looking forward to Thanksgiving, I’m thinking about my mom’s training in writing thank you notes (as well as her stuffing). I’m also remembering the out-of-the-blue thank you note I got from an neighborhood acquaintance, Erik, couple months ago. That note from Erik did two things. First, it made my day! I had been doing my advocacy thing feeling pretty much on my own, behind the scenes for a couple of years. I was happy to do it, but figured it was invisible to the world. Knowing that someone who I hadn’t talked to for three years had noticed it, appreciated it, and bothered to send me a note made me feel a lot less alone in that work. Second, I felt closer to Erik. We hadn’t spoken in years, and had never been close friends or colleagues. Despite that, simply by telling me thank you, I suddenly felt like I could call him up and ask him a small favor, or ask his advice. I trusted him more. Remembering that experience, I’m sending personal (email) thank you notes to a few network colleagues, sharing specific things I have noticed and appreciated as we build our connections.